Larry Unruh saws a felled shrub into small pieces for easier transport to the bonfire at Beaubien Forest Preserve. 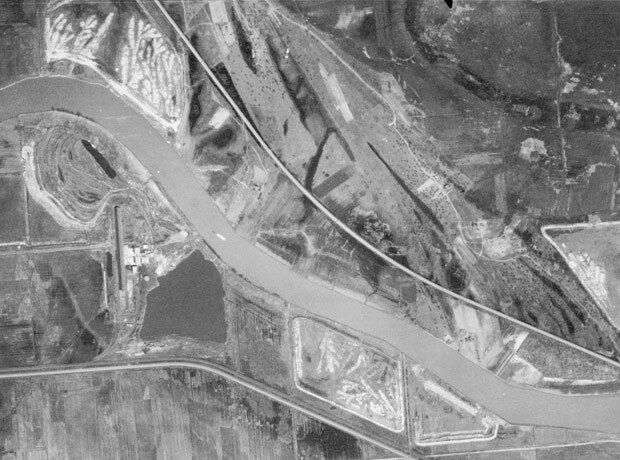 Raw Imagery: Illinois Natural Resources Geospatial Data Clearinghouse, Illinois State Geological Survey / Illinois Historical Aerial Photography 1937-1947. Georeferencing, image processing by Field Museum Staff. The site of Beaubien Forest Preserve in 1938. Sandwiched between the Bishop Ford Expressway and the Little Calumet River and within sight (and occasionally smell) of two landfills, Beaubien Forest Preserve is an unlikely swath of wet prairies and old-growth oak trees amid the industrial patchwork of Chicago’s far Southeast Side. Each month Laura Milkert, the Forest Preserve District of Cook County Site Steward for Beaubien, leads volunteers on workdays to help maintain the Preserve’s 135 acres. On Saturday they practiced a kind of eco-time travel, removing invasive species that have crowded out native species like white and burr oaks, redtop grass and rough blazing star. The goal is to restore a habitat that more closely resembles the area’s original prairies and wetlands. Though 209 native plant species have been identified at Beaubien, biodiversity has plummeted since invasives took root. Native species like big bluestem grass and buttonbush are not just visually appealing — they hold the soil against erosion and harbor wildlife. Biodiversity in prairie systems can have a dramatic impact on an ecosystem&apos;s properties. In January, of course, those iconic (and exquisitely named) wildflower species would not be visible anyway, but the frozen ground afforded the volunteers a chance to clear away the invasive species that have colonized Beaubien without trampling the rest of the forest floor. The invasives are the usual suspects for Northeast Illinois: buckthorn and honeysuckle, mostly. The shrubs grow voraciously, crowding out sunlight otherwise destined for young oaks and other native plants. Volunteers sawed and hacked through the plants’ spindly branches, leaving oaks and other native species intact. They piled the brush onto a bonfire and applied herbicide selectively to the stumps of cleared invasives. Once an important stop on the underground railroad, Beaubien is situated directly east of Altgeld Gardens, the neighborhood where Barack Obama got his start as a community organizer. Maintaining the forest preserve is community work, too, according to Milkert. “The story of Beaubien is it’s a real collective effort,” she said. Other volunteers with Friends of the Forest Preserves clear away cottonwoods with chainsaws, some 350 local students had hands-on ecology lessons onsite last fall through Calumet Environmental Education Programs, and a group called Fishin’ Buddies connects local kids to nature through fishing trips to Beaubien’s Flatfoot Lake. Students, interns and volunteers logged more than 1000 hours of work at the site in 2011, Milkert said. Stephanie Ryan, a graduate student at Northeastern Illinois University, also named community among her reasons for spending Saturday morning in the woods. “It’s something we need more of these days,” she said.